Picture art in Nairobi streets, music, poetry, and every sort of contemporary art. Isn’t that what we all long for especially with the hustle and bustle of the Nairobi we know? If you are like me, I bet you long for a different scenario- a comic relief of sorts. 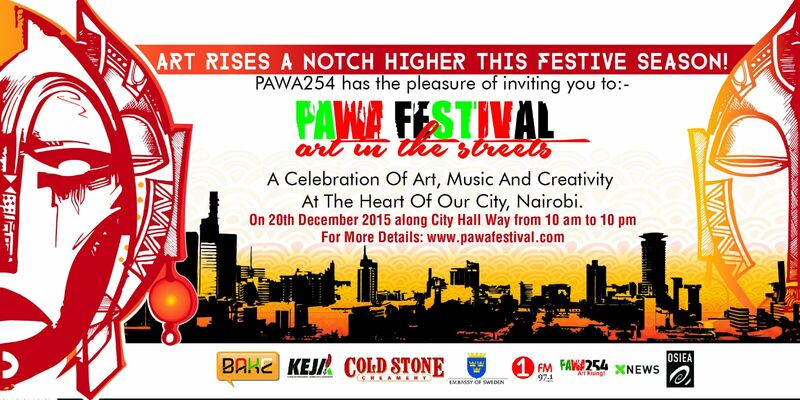 Well, your vision and mine is being brought to life this Sunday at the PAWA Festival- Art in the Streets. The inaugural edition of the PAWA Festival has been made free to ensure that everyone has a chance to experience the power of Art. It is an annual street festival that will take place on 20th December 2015, from 10.00 am to 10.00 pm at the heart of Nairobi’s Central Business District. The specific street will be City Hall Way, opposite the Kenyatta International Convention Center. This festival will act as a platform for innovative young artists to showcase their creative genius though socially conscious visual Arts. Also through performance of quality pieces including: public installations, film screenings, photography exhibitions, music; poetry; and literary readings. There will as well be a Governor’s Desk, Dialogues and workshops on social accountability issues. Santuri Safari will lead a line-up of dedicated DJs to ensure there’s non-stop musical delivery. The MC of the day will be Obinna Ike Igwe. There will be a showcase of Art, Music and Creativity. 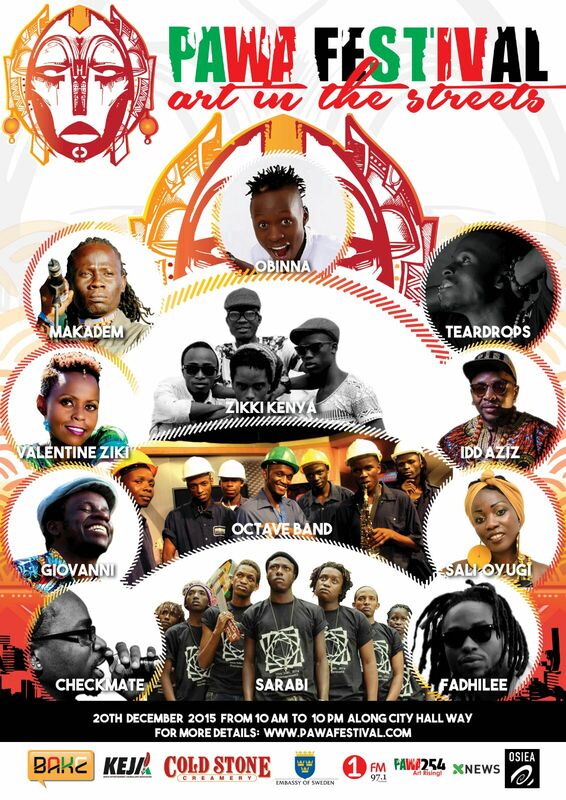 Performances by Makadem, Sarabi Band, Giovanni, Lamebrain, , Sali Oyugi, Octave Band, Zikki Band, Valentine Ziki, Checkmate Mido, Fadhili Itulya, Idd Aziz and Blinky Bill will keep you entertained. You will also enjoy visual artists from Faith Wanjala, Nancy Cherwon, Salim Busuru, Nancy Tind, Clavers Odhiambo and Alexa. For those of us who like to shake a leg, we will have dance by Art and Abolition and Street Dance Kenya. This will be a family getaway with a children’s fun corner. The young ones will be wowed with magic tricks from Sebastien the Magician, a bouncing castle. I know you are asking about where to get your refreshments and stuff. They have got you covered by having select vendors in place. PAWA Festival is an attempt to reach new audiences, mainly emerging artists and art enthusiasts. This is a public space where diverse art forms can be accessed. It is borne out of the Art in the Streets showcase that took place in 2013 along Tom Mboya Street. Separator image Posted in Dada's Hangouts and tagged with Art in the Streets, children's fun activity, Contemporary Art, Entertainment, family getaway, Makadem, PAWA 254, PAWA Festival, Sarabi Band, Teardrops, Zikki Band.